Warning: This post is a little picture happy! I can't get to Christmas without showing you my Thanksgiving. What a grand time I had with my family, I always do! Everyone in my family cooks. So I had a lot of help. I think at one time we were ALL in the kitchen! Here's my sweet mama. The one who created this kooky girl. Isn't she the cutest?? And what's a family get together without silly pics with your sister!! I grabbed my tools, (my husband silly!) and went to work. I had a little sample of green paint in the garage and in my typical instant gratification fashion, I used it. I mean, who wants to go to the paint store and take the time to find that perfect shade? Not this impatient girl!! Case in point- I'm already painting while hubby is taping! Anyhoo, she turned out like this!! I think they add just the right amount of red doncha think? The tree I had last year in the little rental bungalow just seemed too sad and Charlie Brown like to grace my front window. So I (was an idiot) braved Target on Saturday to buy this 9 ft. beauty. Sooo much better! This Santa was my first really "expensive" Christmas decoration. He's sitting on my counter near the candy maker cabinet. I've been sitting here trying to figure out how to start this post, and my brain is not cooperating . Maybe because I'm high. I came home from doing last minute Thanksgiving preparations, (getting a mani/pedi! Duh!) to a house with every window open, ceiling fans on, and the heater cranking. Not one foot in the door and the fumes hit me. My sweet love of my life decided to put a coat of something that will forever damage your lungs, on the cellar floor. I held my breath and braved the toxic elements to get these pics for you. Anything for my blog buddies!! I came across this blog a few weeks back where Susan showed this tutorial on how to make these cutest felt flower pins. Susan suggest sewing hers, but I just used hot glue. But seriously? Sometimes I feel like I'm not alone. Maybe because I face the "wall o dead" as I like to refer to it. All those old pictures are of my hubby's family, in the most beautiful old frames. I really do treasure all of them. But one in particular, just stares. And stares. At me. I try to break the creepiness by taking a glance at Wallace's baby pic, (I know! he was sooo adorable) but then I look up- and there she is!! She has such a stern look to her, but her eyes seem so gentle. It's like she's keeping me in line or something? And it's like she knew I was going to say something about her being a little creepy, because no sooner had I taken this pic that I hear WHAM! I turned around to see this. My sweet baby Wallace pic on it's side. Hmmm. My hubby said "are you okay?" from downstairs. **Oh and that shelf thing on the "wall o dead" is an old plate rack I found in my son's backyard when he bought the house. Score!! After just cleaning off my mantle from Halloween, I'm sort of in a funk. Can't figure out what to put up there for Thanksgiving. No really, I just keep staring at it with the hopes that something will inspire me. Nothing. So I went searching. 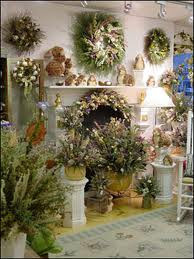 I googled Thanksgiving mantle decoration and look what came up!!!! SERIOUSLY??? What the??? Huh?? Oh, come on!! I've been laughing so hard over this picture!! It's HIDEOUS!!! I mean, I don't think I owned even two of those dried thingys back in the 80's when they were popular!! Maybe I should have typed in Thanksgiving mantle decoration 2010??? In other hideous news: I broke down. I bought a microwave. (what you can't hear is the applause and whistles from the hubbs.) I hate microwaves. We've been living without one for about 2 years now. On purpose. I heat things up old school. In a freaking pan. On the stove. Like we all used to before the microwave. But after listening to my hubby complain time and time again about my old school ways, I caved. So here sits the beast. A tiny beast, the cheapest tiniest beast I could find. She's ugly and doesn't deserve the prime real estate she's hogging on my counter. But worse? She's supposed to be sitting on a shelf in my pantry. Yep right there. The hubby even put a plug in there while we were building in hopes of someday owning his precious micro. 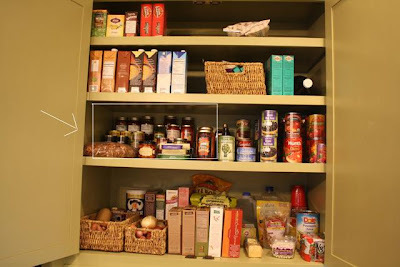 But when I look at my lovely organized pantry, I can hardly bear the thought of making room for that ugly. And I weirdly think it's going to emit some crazy something all over my food. Counter? Pantry? Counter? Pantry? It's a lose- lose situation :( Your thoughts? ?